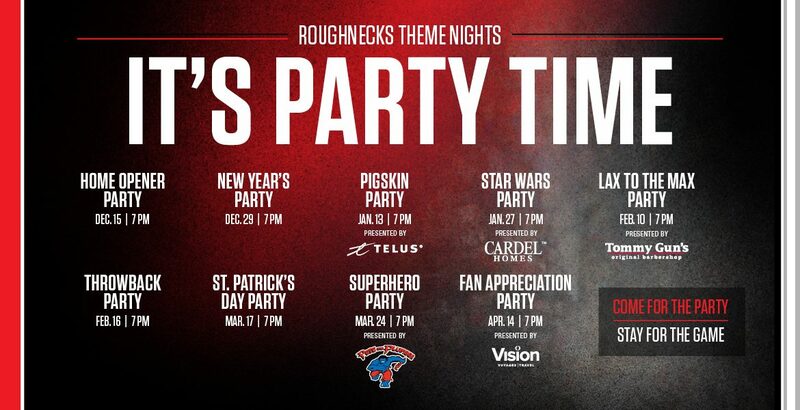 CALGARY, AB – The Calgary Roughnecks today announced their theme nights for the 2017-18 National Lacrosse League season. New this year, the party in the Rough House begins with a $5 Happy Hour featuring food and beverage specials on the concourse. The $5 menu will run from 5:30 – 7:00 p.m. during all nine weekend home games. The Roughnecks (0-1) home schedule kicks off tomorrow, Friday, December 15, against the West Division rival Vancouver Stealth (0-1) and features a special halftime performance by the Dueling Piano Kings. Following each home game, all fans in attendance can head down to the turf for autographs and photos with the Roughnecks. Single game tickets start at $38.75 for adults, $29 for students and $22 for children (excludes applicable fees). Visit Ticketmaster or the ’Dome box office to join the Rough House party. Fans can also secure a seat online at CalgaryRoughnecks.com or by calling 1-855-985-5000.